SOLD Prominently positioned along a coveted Pacific Heights flat block, this grand residence captures San Francisco’s world renowned views from the Golden Gate Bridge and Alcatraz to the enclaves of Sausalito and Belvedere Island. Amidst this scenic grandeur and nestled amongst the city’s most venerable mansions, this 5,500 +/- sq. ft. home, designed by noted architect Edgar A. Matthews in 1900, boasts pride of ownership with traditional architectural detailing and sophisticated contemporary interiors. 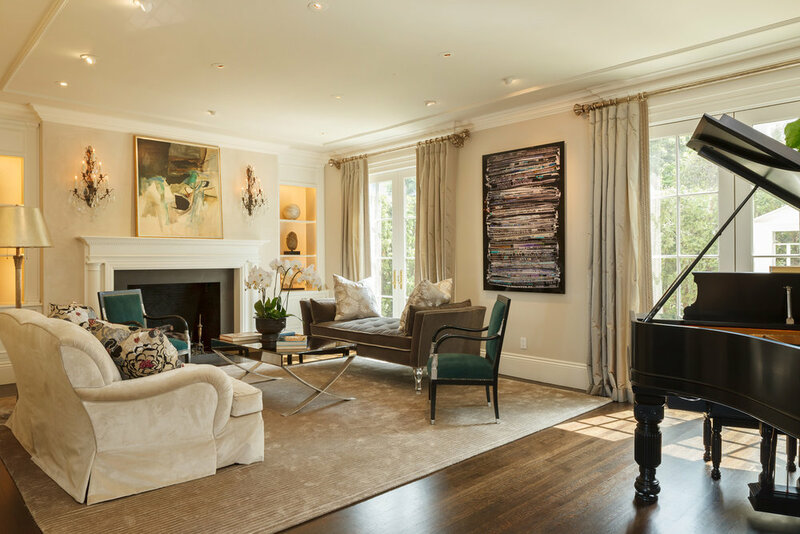 Painstakingly renovated under the direction of Shirley Robinson Interiors, the residence is comprised of five bedrooms on four levels. A secluded location granted from tall cypress trees bordering the front of the property offers an immediate buffer from the hustle of city living. 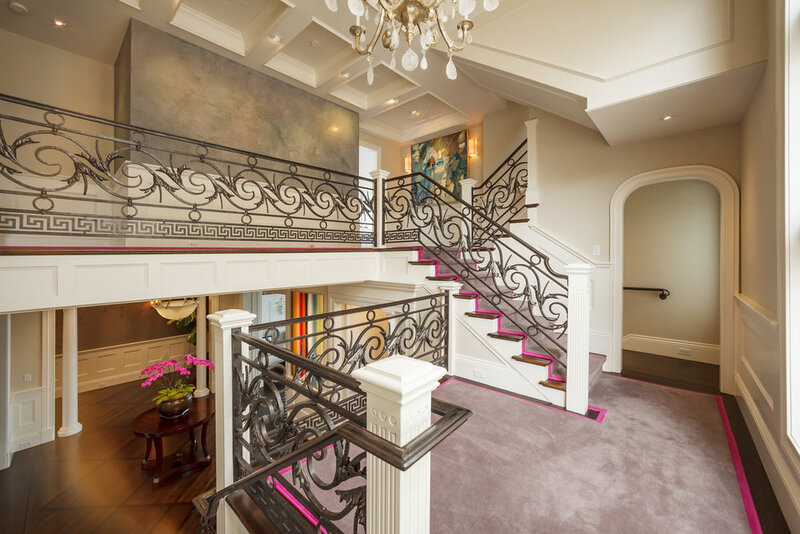 Upon arrival, the sky lit entry hall pend to a spacious foyer connecting the living and formal dining rooms. This arrival point is flooded with natural light from a wall of diamond shaped glass leaded windows. The main floor features an impeccably designed eat-in kitchen and a luxurious view seating area off the formal dining room. The second level of the home, accessed by an elegant wrought iron staircase, is comprised of a spacious Bay master suite with two ensuite baths and a wood paneled office/study accented with a wood burning fireplace, light flooded south windows and a bath. The top floor of the home consists of three bedrooms, one with a walk out view deck, serviced by one full bath. Privately, or internally accessed, the lower level serves as a guest / au pair apartment with a large living area, full kitchen, one bedroom and bath, laundry rooms large terrace, and wine cellar. The ground level of the property has two separate garages accommodating three cars, additional storage, and a large landscaped garden for entertaining and outdoor enjoyment. © 2018 All rights reserved Web site is not the official Web site of Sotheby’s International Realty, Inc.® SIR, Inc. does not make any representation or warranty regarding any information, including without limitation its accuracy or completeness contained on this site.